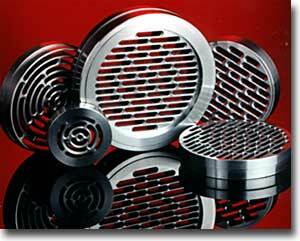 All breaker plates are made from 17-4 stainless steel. 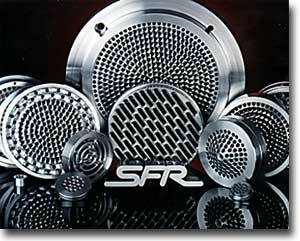 SFR uses a 5/32" standard hole pattern (click here for specifications) with holes drilled straight through and fully chamfered (no flats) on the downstream side. A tool pry recess can be added by request at no charge. Melt fracture at the barrel wall causes discolored streaking or "pinking" of the outer most layer of extrudate. With a standard breaker plate, this degraded material passes straight through and remains at the surface. Pinking is reduced or eliminated with the Inverter by passing the outer most layer of material inward to be hidden, delivering to the surface clean material from the inner flow. Improve the quality of your plastics and reduce scrap byusing the Inverter. This special mixing plate has been production tested in all types of extrusion - blown film, sheet, pipe, wire and profile with great success. Its use is recommended by major compound suppliers in suggested guidelines for troubleshooting procedures. 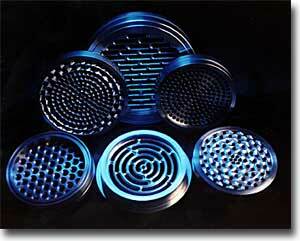 These plates have an average open area of 49-53%, providing a better outlet for certain materials. The unique pattern provides for layering of the material that holes can't provide. The circular pattern minimizes breaker parting lines on an extrusion, layer by layer, for a smooth, creamy surface finish. By adding a 145 degree slot to the outer row, material is delivered line-free to the most critical surface, increasing your customer satisfaction on some of the most demanding extrusions. Our years of experience has enabled us to produce special or custom made breaker plates to accommodate your exact needs. Variations such as 2-piece units, special hole sizes and patterns, and irregular shapes and sizes can be quoted upon request. We make our units exactly as specified and deliver them on time to assure your complete satisfaction.